After living here 5 years, we have come to love some of the local dishes, so I thought I wanted to start sharing some of them with my blog readers. 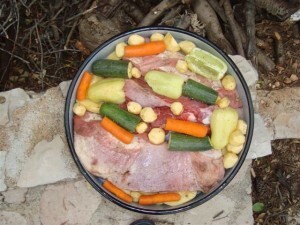 One of my absolute favourite dishes is the Dalmatian Peka, So what is a Peka, well a Peka is a Baked dish with meat and vegetables made in a pot or a tray, the pot is put into the embers of a fireplace, in many houses here in Dalmatia, especially on the country side, you have a special place in the barn or at the ground floor of the house for preparing the Peka. Peka is an absolute top dish in the area, something which is put on the table when there is guest in the house, we as “semi” natives often have had the privilege to taste a real home cooked Peka, and I can tell you it is delicious. My personal favourite is the Veal Peak the meat gets so soft that you can literally chew it with your eyebrows! One of the interesting things about Peka is that you can make with any kind of meat you like, also in restaurants you normally have option to choose between several kinds of meet like, Veal, chicken, lamb and octopus, my colleague has been so kind to reveal, how she is preparing the Peka, so if you are up for trying to make you own Peka here is how it goes. Dishes under the lid are some of the top gastronomic offers in the Dalmatian cuisine, perhaps I am a little subjective because I am a big fan of food prepared under cripnja (this is Dalmatian term for the special bell shaped lid, which is put over the pot/tray, for cooking the Peka). The food is easy to prepare, only you have to catch the “hand” for the right mix of ingredients … and success is guaranteed. For the food prepared in the embers of a fireplace, we can use all types of meat, octopus, fish, squid … here I will post the recipe for preparing veal and octopus under the bell. All the ingredients except the wine to put in a flat round tray and put under cripnja (iron bell in fireplace), and left an hour under the embers. After an hour of baking stir the meat and vegetables and add a decilitre white wine, cover the cripnja again, and let it bake on the embers for another half hour. All the ingredients except the wine to put in a flat round tray and put under cripnja (iron bell fireplace), and left an hour under the embers. After an hour of baking, stir the octopus and potatoes and add a decilitre white wine, cover the cripnja again, and let it bake on the embers for another half hour. 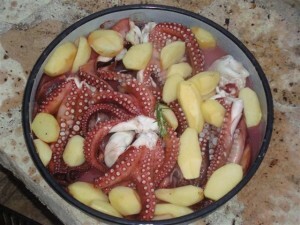 Additional advice for the preparation of the octopus: If you have a fresh octopus it is best to freeze for a day, because then the octopus will be softer. Serve the Peka preferably with homemade bread, and typical dessert prepared in Dalmatian the rožata. Enjoy! Peka is one the menu in more or less all traditional Dalmatian restaurant, so this is for sure something you can try during a vacation here in Croatia, be aware that Peka has to be ordered up front (If you have lots of patients you can of course also order when you come to the restaurant) as it takes more than an hour to prepare. The Price for a portion of Peka in restaurant is normally about 60-80 kuna depending on which meat you choose, to our experience we normally only have to order 3 portions to have a enough for 2 adults and two kids with a great appetite. The Peka is normally served on in the Iron pot on the table, so watch out for the smaller kids, as the pot is usually very hot. I like your website very much, but was wondering what theme you use, as I really like the layout. Is it one of your own? 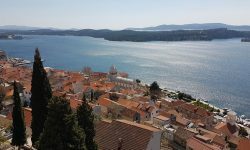 Im learning more and more about Croatia, and have to re-visit some time soon, great blog. Hi Dan, i am glad you like, the Theme is use is called Arthemia Premium and it is from colorlabsproject http://colorlabsproject.com/themes/arthemia-premium/ as i run about 30 blogs on this theme i got the developers version. If you want tray good dalmatia peka you must came in restoran “Konoba Duboković” in island Hvar and tray also anather recept like pašorate,frustule,medenjake,Pitovska cake.Resoran is locate in small but beatiful place Pitve(between Jelsa and Zavala). You can”t know because this food from island and in italian language.People who live in island speak difrent languange .Pašorate is like fritule,brudet is brudet,hrostule,paprenjaci,cviti,rožada and Pitovska cake that tradicinal island cake. I have a peka question! I bought a cast iron peka pan (it has a bottom part and a big lid on the top where you put the coals). The bottom of the pan is made of a rough cast iron…and here is my question: do you put the food directly into the bottom part of the pan, or are you supposed to buy a stainless steel pan, put your food in the stainless steel pan, and then put the stainless steel pan inside the cast iron peka? I’ll give it a try once the weather warms up! Dear Gabriela for peka you must have pan with a big lid .Lid is in the form bell-shaped ,hard and must covers pan .Yours pan is good.Food with spices˙(pepper,salt,olive oil,onion,carrot) put directly in the pan like you burn in the stove .You must have a lot ember because ember put down the pan and on the lid .After 40 minut look and mix ,and burn as late as 1 haurs and 40 minut(dipendent abut meet what you put in the pan)and after that you and your company can enjoy in yours culinary. Thanks for the advice Dragana…I can’t wait to try this! 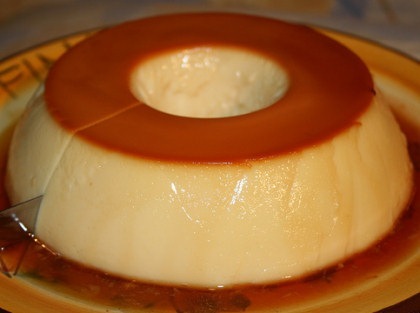 I’m deserately looking for a recipe for the cream to fill Oblate…please help me! Any idea where to buy a Peka pan and lid? Hope you find one somewhere, Peka is excellent dish. Dear Andrew if you don”t come in Croatia you ask Croatia people to bring you lid and pan(people from Dalmatia),but if you visit Croatia good dish for peka you can buy in Imotski. Hi Croatia Expert. Love your blog! I have an answer for one of your readers, Erna. Sorry it’s late though. *For Lemon filled Oblatne: In a saucepan cook together 40 grams of flour, 50 grams of sugar, 200 milliliters of milk and 1 egg until thick and allow to cool. In a separate bowl beat together 250 grams of unsalted butter, 250 grams of icing sugar and the juice and rind of 1 lemon. When creamy, beat in the cooled saucepan mixture until smooth. Spread on wafers. *For Chocolate Oblatne: In a saucepan place 250 grams of unsalted butter and 375 grams of dark chocolate. Once melted remove from heat and add 1 tin (397 grams) of condensed milk then 250 grams of finely crushed walnuts. Mix thoroughly and spread on wafers. Just came back to Canada from Europe. I visited Croatia and tried the meat Peka at the Kastil Slanica. It was in fact the best meal I had on my entire trip. Loved the food in Croatia!!! glad to here that, Peka is for sure one of my favorite dishes. Hi, Can anyone tell me where can I buy a Peka? Can anyone point me to a website where I can buy a Peka pan/lid online? Try to contact this company (Tomdar) in Bosnia and find out what would be cheapest solution to have your “peka” delivered to USA or Australia by them or by their distributors.